How do I download an individual podcast? Sakai Guides and DocumentationSakai Complete User Guide PodcastsHow do I view or download an individual podcast? Zoom: Click Download for the podcast you want to listen to..
Find the podcast you want to view, and under its title, click the Download link. The file size and type are listed next to the Download link. If prompted, you may choose to open the file or save it to your computer. 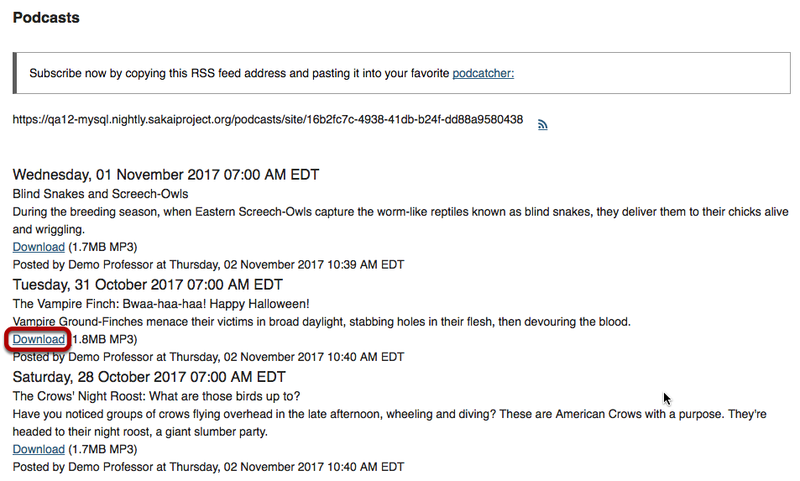 Note: Podcasts are listed in order by date published, with newest at the top. Prev: How do I allow students to upload podcast files? Next: How do I delete a podcast?